Fabulous Direct Oceanview Home in Ocean Lakes #1101 ~ 2nd Row!!! If you like direct ocean access and views, we have a Beautifully-Decorated Custom-Built direct oceanview home (75' from nearest ocean access-Site 1101). This home includes an open floor plan with large kitchen, dining & family room with lots of windows and natural light! Dining for 11! * Magnificent OCEAN VIEWS from all five bedrooms. * Master Bedroom with three bay window overlooking the Atlantic Ocean. * Three Bedrooms with Queen-Size Beds and one Bedroom with one Double and twin bunk with pull out twin trundle (great for kids). * Each bedroom includes remote color television. ** Smooth Surface Slide-In Range. ** Ultra Quiet Top-of-the-Line Dishwasher. ** Glass Top Dining Room Table that will seat 7 people and bar seating for 3. ** Enclosed Washer and Dryer Area off the kitchen. * Pets are NOT allowed and NO Smoking Strictly Prohibited!!! * Covered Parking that will accommodate up to three full-size autos or four compact vehicles. * One-Mile of 'Grand Strand' Beach with Lifeguards, Chair & unbrella rentals, and Boat Rentals. * Activities for kids, teens, and adults organized by Ocean Lakes Staff, which include, but are not limited to, such things as Bingo, Children's Day Camp, Crafts, Concerts, etc. * Arcade, Basketball Courts, Biking, Boating, Fishing, Horseshoes, Miniature Golf, Indoor and Outdoor Pools, Three Playgrounds, Ping Pong Tables, Beach Volleyball. * General Store, Three Snack Bars, Nature Center, Golf Cart Rentals. * Guarded Front Gate with 24 hour Security Patrol and 10 MPH Speed Limit. * Ocean Lakes charges $10/day per car to obtain parking Passes, this is a separate charge and is not included in our quote. This award-winning resort provides a fun environment where the kids are free to move about safely. Once you stay here, you may never want to stay anywhere else on the Grand Strand. Nearby Attractions include: The Aquarium (the most visited tourist attraction in South Carolina), Concerts, and Shows in Theaters, such as Alabama, Legends, the Palace at Broadway, Carolina Opry, Dixie Stampede, Medieval Times, etc. The Grand Strand host more than 100 golf courses, some rated the highest in the world. And the kids will not want to miss The Pavilion, NASCAR Park, Wet and Wild, Myrtle Waves or one of the other theme parks in the area. 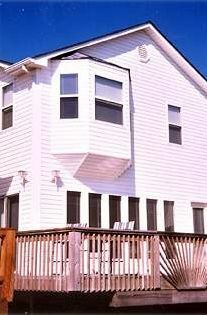 Keywords: 2-Story Beach Home with great views & a few steps away from the Ocean! We are a family of 4 with 2 kids 8 & 3 from Greenville, SC, we have 2 Aussie Shepard pups (11 weeks), 1 cat (9yrs), 2 hermit crabs from Myrtle Beach, 2 millipedes from a 'summer camp' who are almost 1 1/2 years old and a horse (newest addition 10 yrs old) very busy and active family who love Ocean Lakes! We recently purchased our 2nd rental/vacation home in OL called Palmetto Place II (1101) our first home is Palmetto Place (1197)!!! If you have stayed there then you know the quality and service we try to provide! It is challenging from a distance but we strive to please our guests and offer a very clean, comfortable and updated environment!!! Close to Ocean!!! Just purchased this home in November 2013... changes are being made & pix updated ;) Please check out our other listing for pix, prices, & reviews etc...VRBO 28630 /site 1197! outdoor shower, Outside shower attatched to the home for washing Sand OFF! 2nd Row ~ Great View!!! Kitchen & Bed linens provided... Guest must provide own Beach & Bath Linens! Table dining seats 8, Bar dining seats 3 all in the same area ~ open floor plan! Kitchen & Bed linens Provided. * Golf Cart for rent but not included in rental! Ocean Lakes charges $8/day per vehicle paid to OL.